Editor’s note: TensorFlow, our open source machine learning library, is just that—open to anyone. Companies, nonprofits, researchers, and developers have used TensorFlow in some pretty cool ways, and we’re sharing those stories here on Keyword. Here’s one of them. At Google I/O this year, we saw how high school students Shaza Mehdi and Nile Ravenell developed PlantMD, an app that lets you detect diseases in plants using TensorFlow. These young researchers are not alone in their mission to help farmers. PlantMD’s machine learning model was inspired by a dataset from PlantVillage, a research and development unit at Penn State University. PlantVillage created an app called Nuru, Swahili for “light,” to assist farmers to grow better cassava, a crop in Africa that provides food for over half a billion people daily. Though cassava is tolerant to droughts and capable of growing with minimal soil–making it an ideal crop in harsh weather conditions—it’s also susceptible to many diseases and pests. The symptoms of a diseased plant develop slowly, so it can be difficult for farmers to diagnose these problems in time. 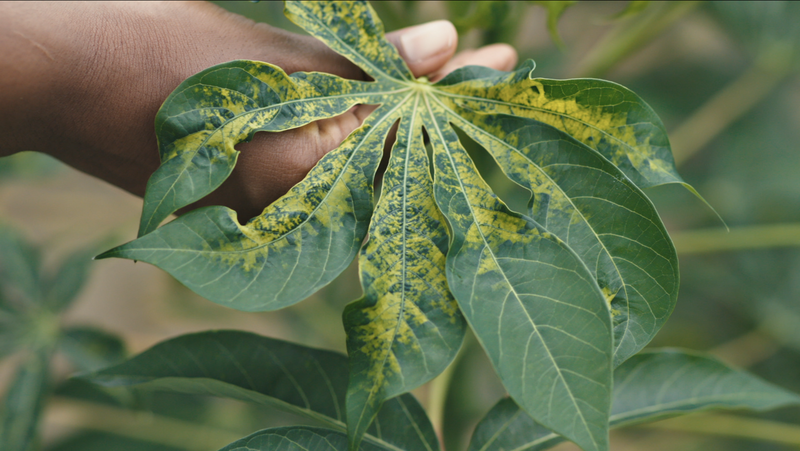 PlantVillage and the International Institute of Tropical Agriculture (IITA) developed a solution using machine learning that could help farmers better identify and manage these diseases quickly. They annotated thousands of cassava plant images, identifying and classifying diseases to train a machine learning model using TensorFlow. Once the model was trained to identify diseases, it was deployed in the app. 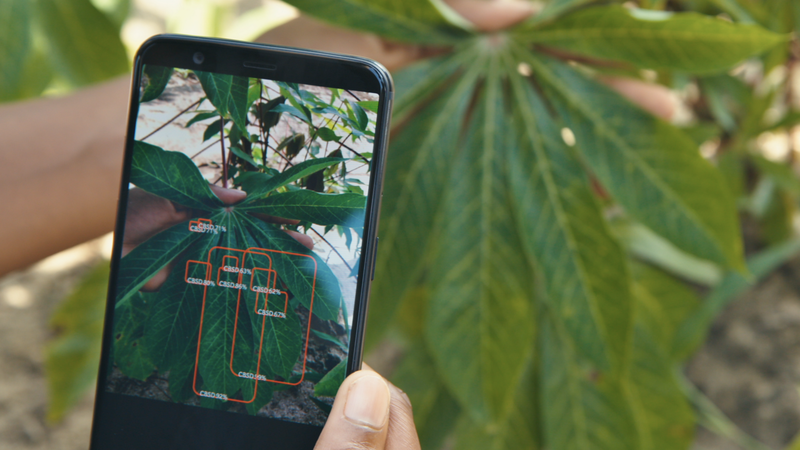 Farmers can wave their phone in front of a cassava leaf and if a plant had a disease, the app could identify it and give options on the best ways to manage it. An example of a diseased cassava leaf. Cassava is a crop that provides for over half a billion people daily. Farmers in Tanzania are using the Nuru app to better manage their cassava crops. Nuru the app works by waving your phone in front of a cassava leaf and identifying specific diseases. PlantMD and Nuru are part of a larger trend in the agriculture industry. 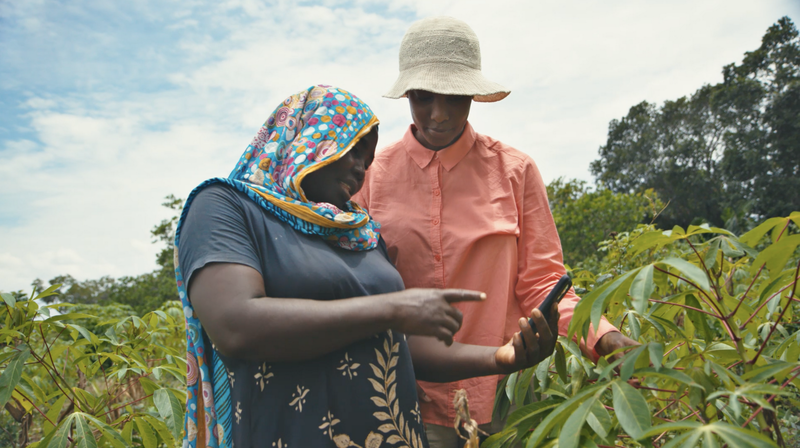 Whether it’s dairy farmers in the Netherlands, cucumber farmers in Japan, cassava farmers in Tanzania, or your neighborhood gardeners, AI is taking root in agriculture and is helping farmers around the world.